Kitchen Snaps: Simple Black Bean Soup ~ You'll make again and again! 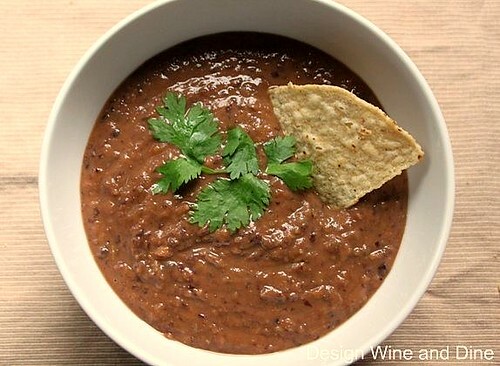 Simple Black Bean Soup ~ You'll make again and again! It's cool and damp outside, football's on and I can smell the faint aroma of charcoal grills and someone burning leaves - I couldn't have staged a better backdrop for this soup if I tried! The only thing my poor unsuspecting neighbors are missing, is a wafting stream of sauteing onion, carrot and celery twisting its way out of our house straight into their windows! As promised, here's the Black Bean Soup from last weeks football cookout. I recall the recipe appearing many years ago in Real Simple magazine. I've scoured the web in search of the actual article to no avail. No worries as I've made this simple, delicious, healthy soup so many times...it's one of the recipes I know by heart! This is one I promise you will make over and over again! Add cumin and stir for 1-2 minutes. Add carrot and celery and continue sauteing for another 3-5 minutes, stirring often. Add beans and stir entire mixture for 1 minute. Add stock, stir and bring to a boil. Turn down heat to a simmer, cover the pot and cook for 20 minutes. Remove from heat, remove lid and let sit a few minutes. Taste and S&P only if needed as sometimes the stock adds plenty of salt! That soup would be excellent with my chicken enchiladas. I love beans. We absolutely love black bean soup in our house! (Although my husband usually dumps in way too much hot sauce.) This recipe sounds delicious! I have a very similar recipe that I LOVE and make frequently during football season! Isn't it great having a battery of recipes you know by heart? I'm working on that one! This looks and sounds delicious. And I can't help but think it'd be a great Halloween party recipe served in little cups with grated sharp cheddar over the top. Thanks for sharing! We love black beans. This looks like a perfect recipe to try!